When I first bought this iron, it worked great. I had no problems ironing any of my clothes or any type of fabric, but after time its ability to successfully remove wrinkles diminished. The iron seemed to be catching on the clothes as I would iron which made it difficult to fully iron a garment and get it wrinkle free. I tried using different settings to see if it was a temperature issue, but it didn’t help. It was actually worse on the cooler settings. After trial and error, I finally figured out a system to get my clothes wrinkle free, without buying a new iron. I used the highest setting and had to constantly use the steam while ironing. The constant steam seemed to help the iron glide more easily on the clothes and quickly press out the wrinkles as well which shortened my ironing time. From my use of it, this iron leaks water when it is lying flat while ironing. Most of the time water drips out of it as I am ironing. It’s not that big of deal since the water dries as soon as the hot iron goes over it. Aside from these issues, this is a great iron. After much use it still works although I have to use the highest setting. 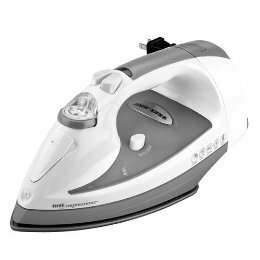 The one feature that really makes this iron great though is the retractable cord. You pull out the cord when you want to plug it in and then press a button and the cord retracts. Occasionally, the cord does get stuck while retracting and you have to pull it out and try again. I was able to look over this slight inconvenience of the cord having difficulty retracting because of the convenience of not having a cord dangling everywhere while the iron was not in use. This is a great iron considering the amount of use it has had and the fact that it is still ticking.